If your looking for a stylish, comfortable and reputable home cinema sofa your theatre room then look no further. 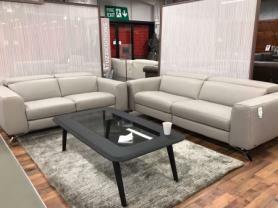 Made in Italy by Natuzzi in thick Italian protecta leather Wave II ticks all the boxes. Power headrests and power recliners on every seat make it the must have for your cinema room. Touch sensitive sensor buttons which make it extremly easy to use and find your favourite position. Cupholders sections are available either straight or wedge shaped and also have a storage cabinet which is handy for all your needs. This is a modular cinema sofa so you can take out seats or cupholders or add to it as per your requirements. Approximate Measurements: L:425 cm. Depth:104 cm.